We are down to the last week, my friends. But before we run head-first into this crazy last week of 2013, let’s look at the week that just wrapped up. 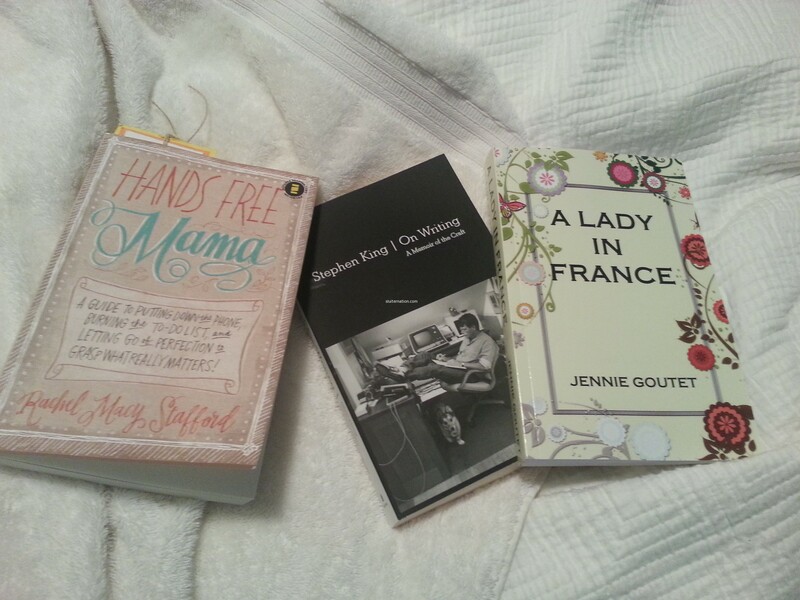 December 17: Taking stock of my reading for the next few weeks…not a piece of fiction in the bunch! 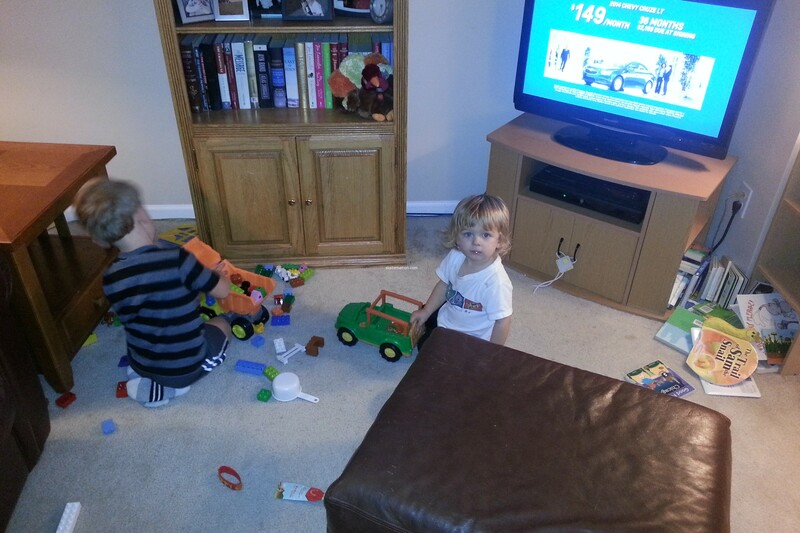 December 18: Our first Christmas party (with Cortney’s stepmom) brings the first new toys in the house. December 19: Made a bunch of banket for a staff potluck that ended up not happening because of a snow day. More for us! 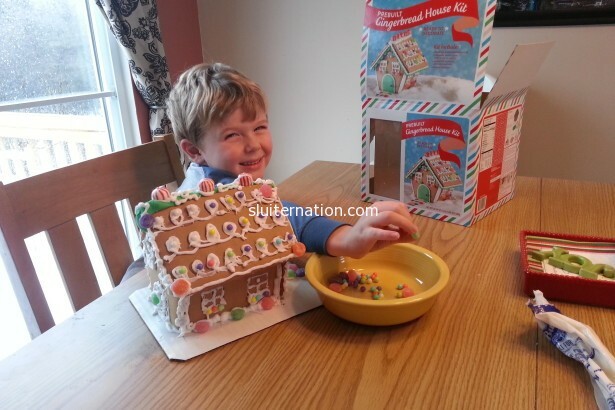 December 20: A snow day meant Eddie’s class’ party is postponed until after break, so we decorated a gingerbread house during Charlie’s nap. 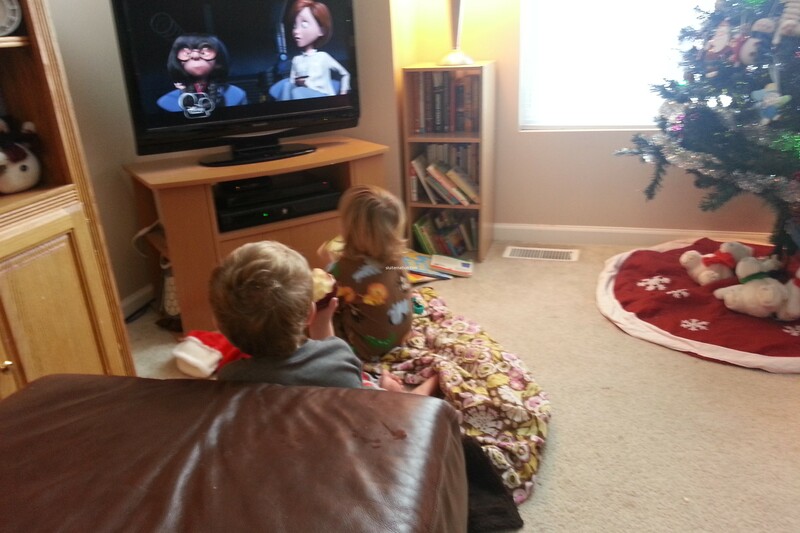 December 21: Lazy Saturday morning = The Incredibles and apple munching. This week is jam-packed with friends and family and food and fun! Oh, and I have a holiday music giveaway going on…go enter! Happy holidays to all of you, our internet family! I can’t believe we are starting week 50 of 2013 this week. It’s the simple moments that seem so…mundane. Yet they are packed with special. 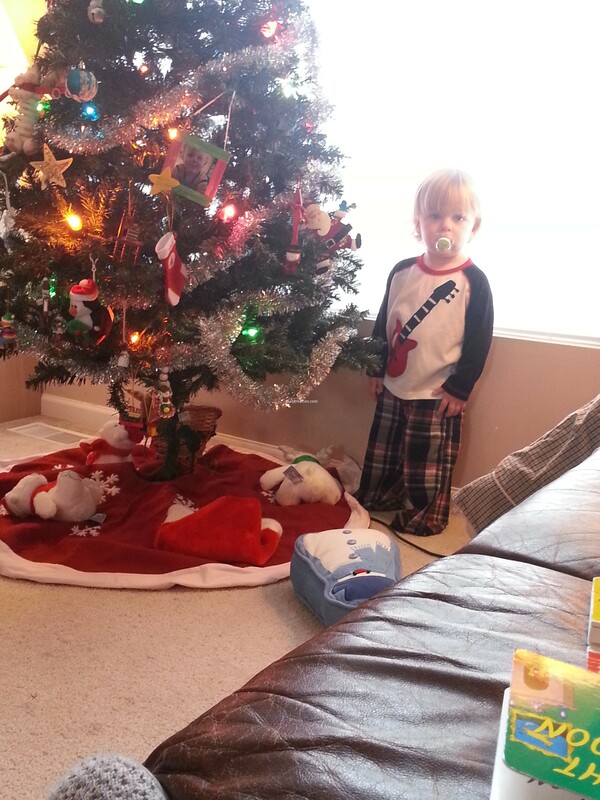 December 1: Caught touching the tree. 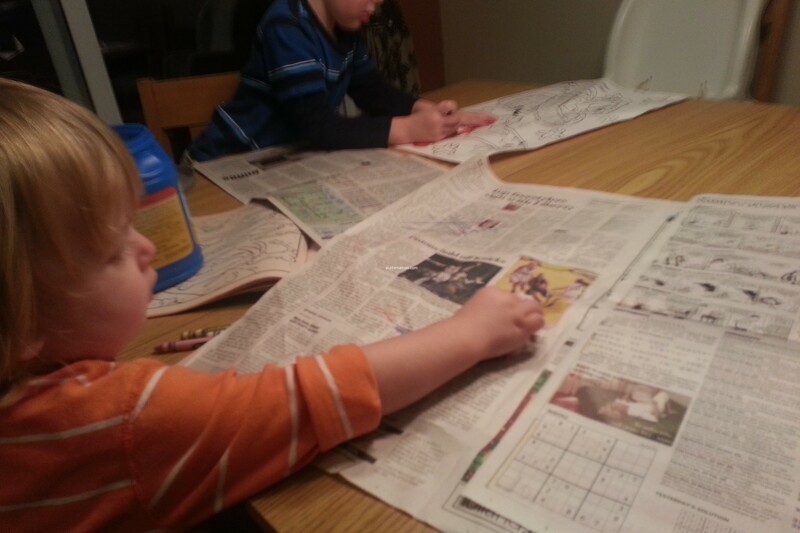 December 2: The boys color their Advent pictures for the day. 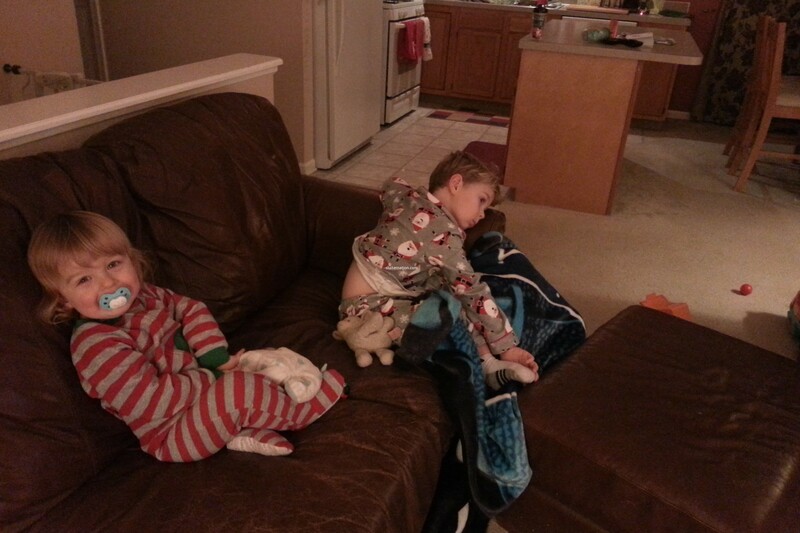 December 3: Tis the season for Christmas jammies! December 4: This guy has a new, mom-approved obsession: Books! December 5: See what I mean? TV is dead to him if it means he can read his flip flap book. 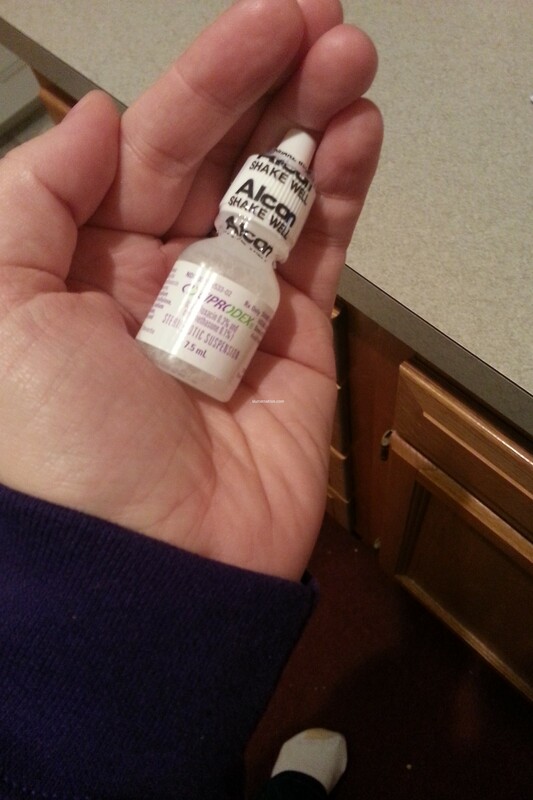 December 6: I finally go to the doctor for the ear pain I have been having for the past month. Yup, it’s an angry ear infection. boo. Drops and an antibiotic. 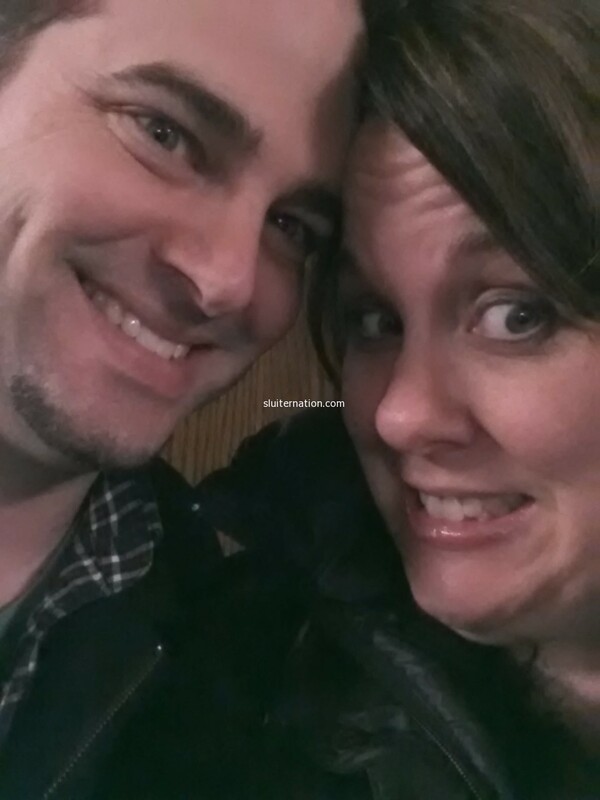 December 7: My mom watches the boys while Cort and I take in a little theater. My school performed Spamalot. Hilarious. 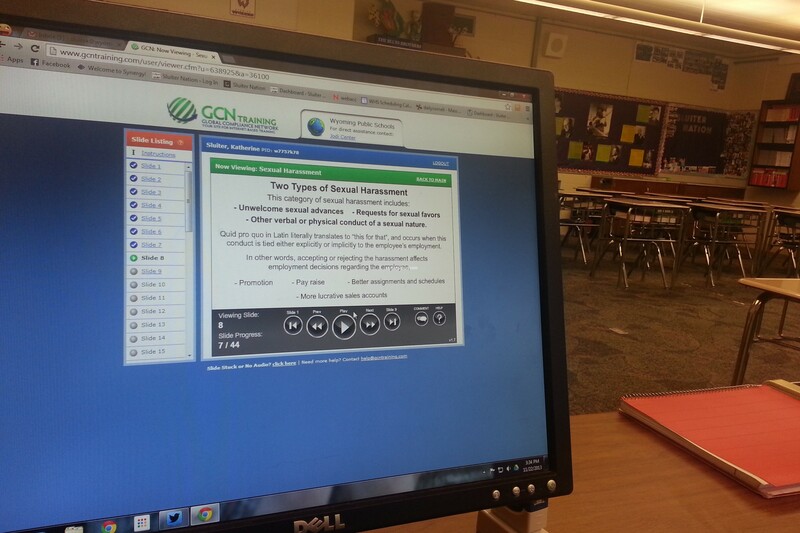 This week I finish up my fall semester of teaching at GRCC by grading research papers and exams. Cortney will turn 35 this week. Eddie and I have a Christmas shopping date. And we have our first Christmas party. It’s about to get busy up in here, yo. Oh hey. Look at that. I went a whole week without blogging. 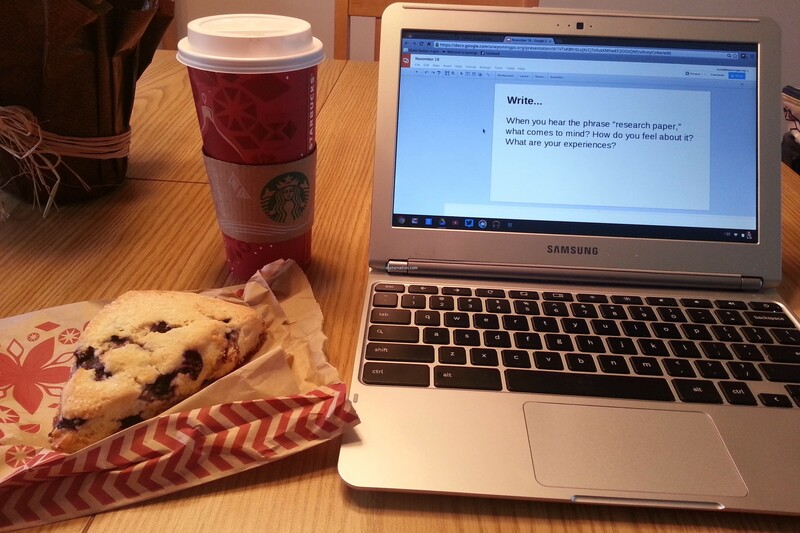 Instead of blogging I graded papers and did some lesson planning. I baked a pumpkin pie. I did over 75% of my Christmas shopping on Black Friday. and registered for two for next semester. Along with my boys I tackled our playroom/family room and WON. I did seven loads of laundry. And I ate a giant Thanksgiving meal. 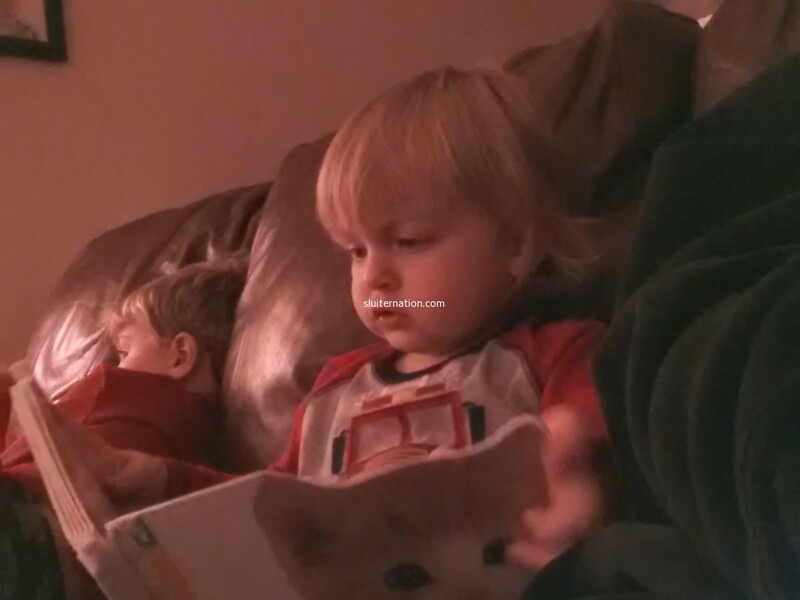 November 24: Reading about cats before bedtime. November 25: Mondays, man. Good thing it’s only a two-day work week. 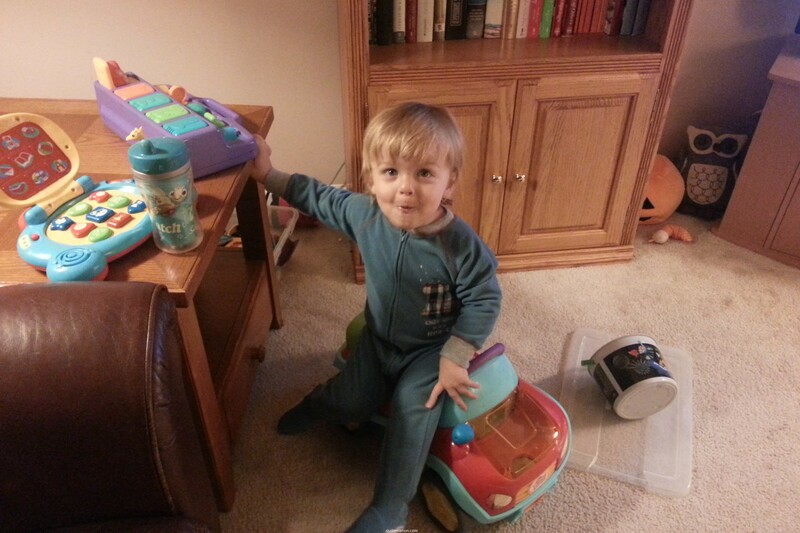 November 26: We made it through the two days of school/work/daycare. WE ARE ON BREAK! November 27: Eddie and Charlie and I tackled this room…even moving large bookcases. It’s finally usable! BOOM! 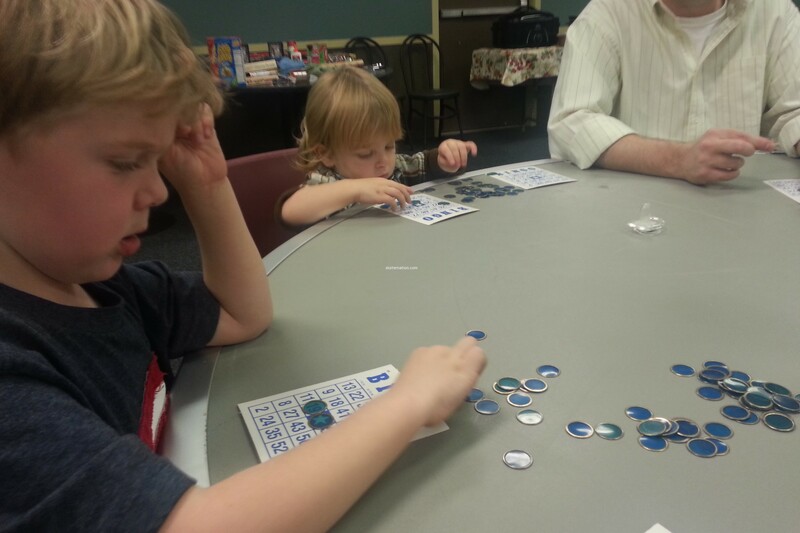 November 28: Nothing says Thanksgiving like a little post-turkey bingo. November 29: Thanksgiving is done which means it’s officially time for the Christmas season! Eddie helped me trim the tree this year. 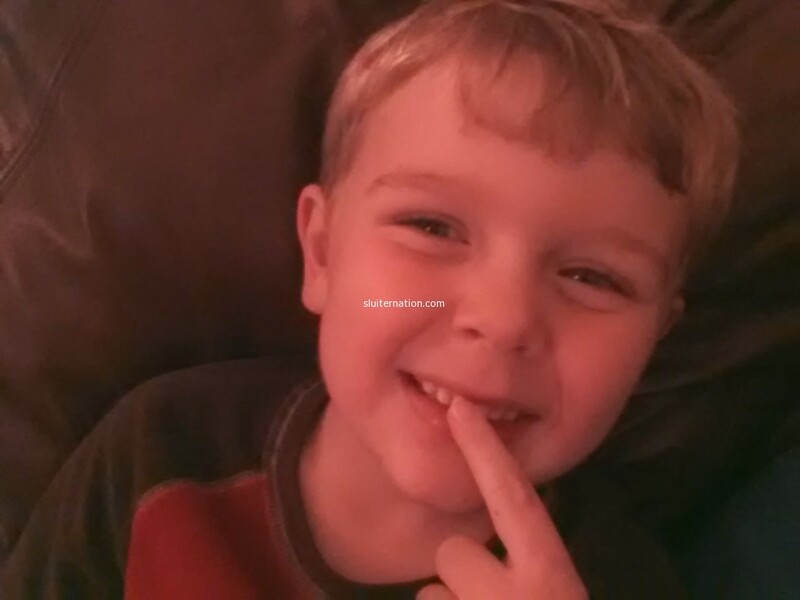 November 30: My little buddy. Cort is bowling in a tournament and little brother is sleeping, so this guy makes it his job to keep me company while I work on the couch. I can’t even begin to explain how needed this time off was. Amid the busy, it was calm. 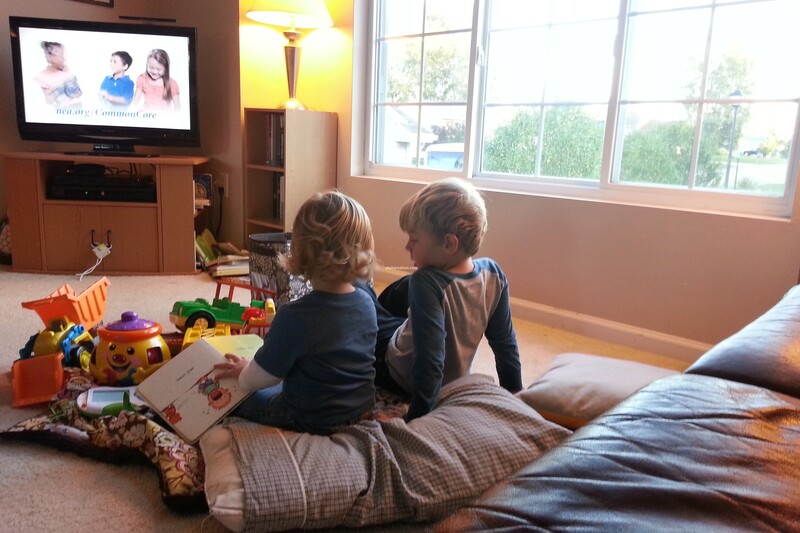 I was hardly on the internet and instead read books and played with the boys. 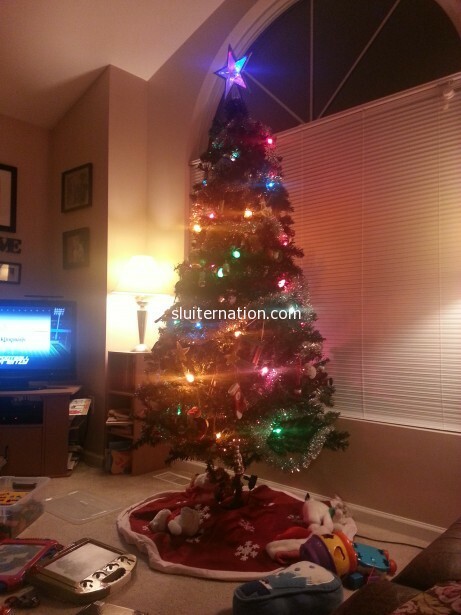 And now as we begin the Christmas season, I will probably also be taking it a bit slower here on the blog. It’s an important time to spend the time we have with each other. I’ll share as we go. This week was one of those weeks that gets off to a weird start due to storms. We had a power outage day on Monday, so I was home, but then Tuesday felt like Monday. But Wednesday felt like Thursday. And Friday felt like Thursday. 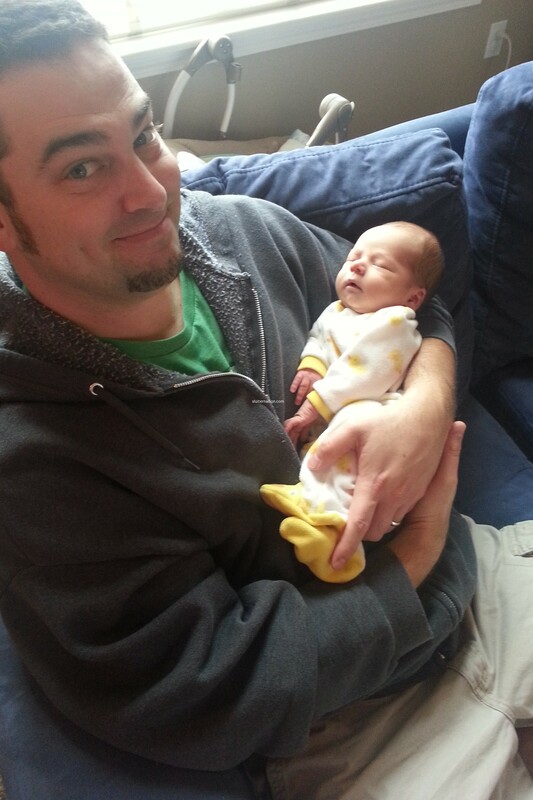 November 17: Cortney introduces me to our newest nephew. I officially catch baby fever. November 18: No school because no power. 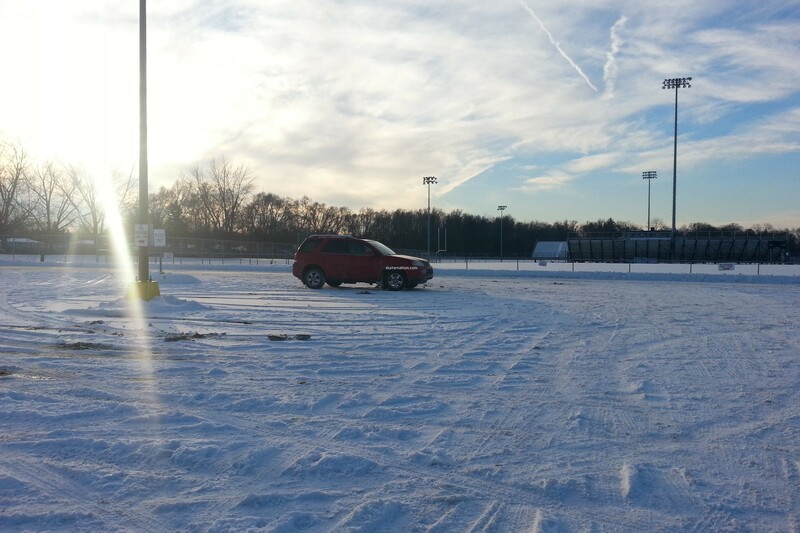 Eddie’s school is not closed, so the boys are off and I am alone. ALONE. Alone to make plans for my college class because all my materials are locked in a classroom in a building with now power. D’oh! 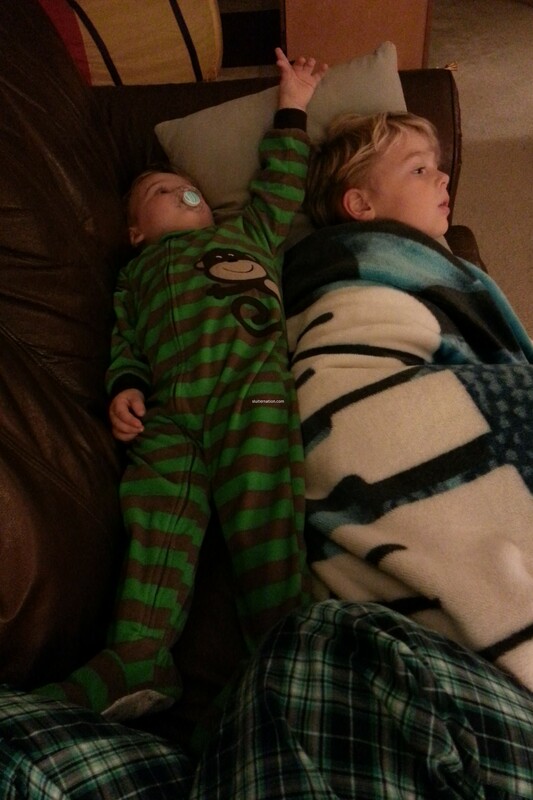 November 19: Brothers being brothers. 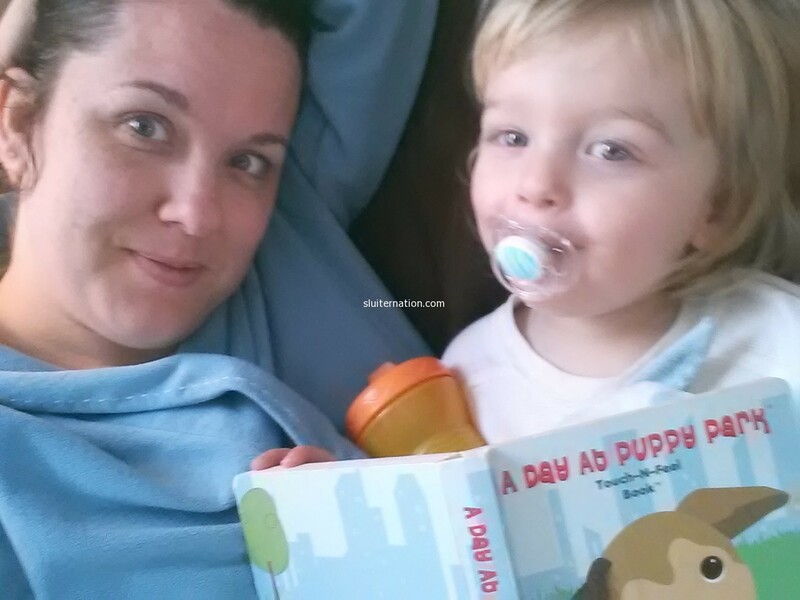 November 20: Who needs coloring books? November 21: Goulash night. He’s sad because he got too full to finish helping #3. Seriously. 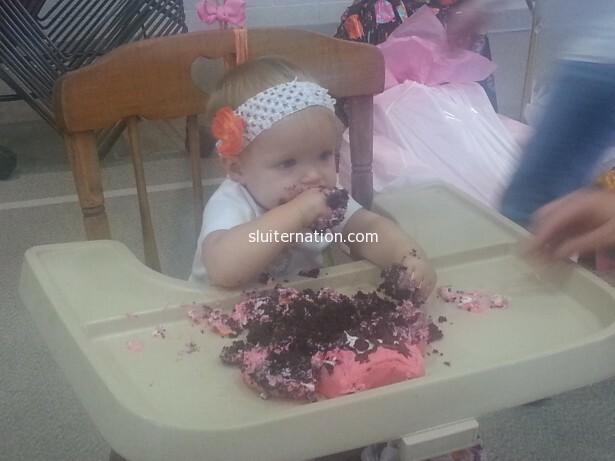 November 23: Our niece, Lilly, celebrates turning one! Yay! It’s not like we were anymore busy than usual, but the week was sort of a blur. Speaking of the holidays, with Thanksgiving this week, I am not planning on posting anything this week. I have only two days of work and then family time for five days. I think I’ll go blog-free for that time. I feel like I hardly saw my family this week. 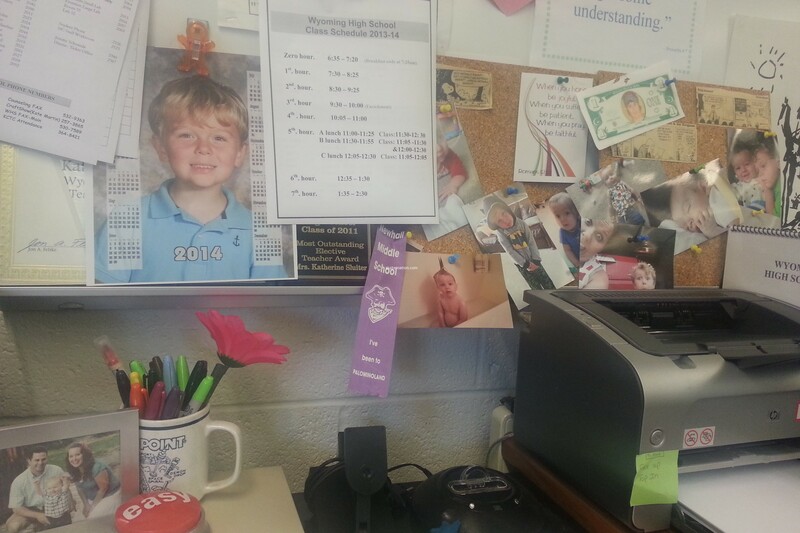 While we added a nephew to the Nation, I also had parent/teacher conferences. 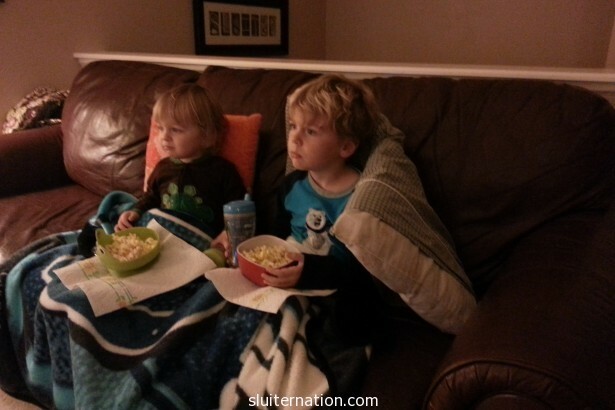 November 10: We wait and wait while Cortney’s sister, MacKenzie labors all day…and night. 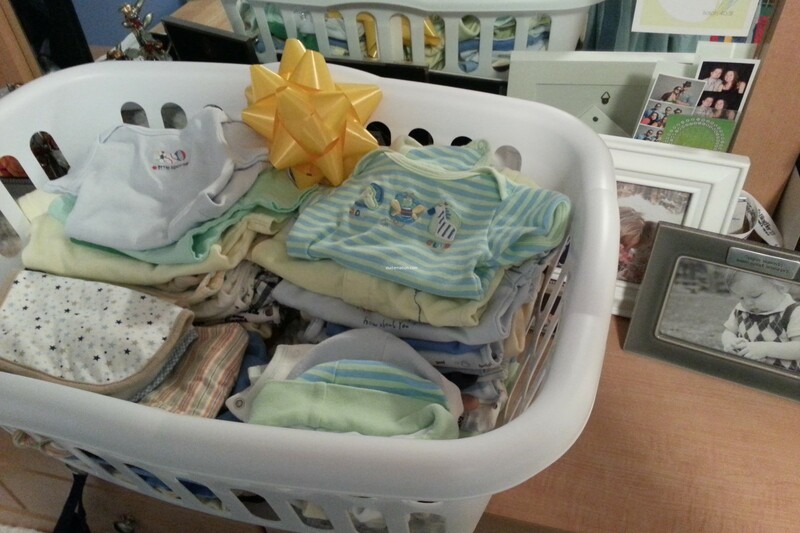 I wash up some tiny things for our new nephew. 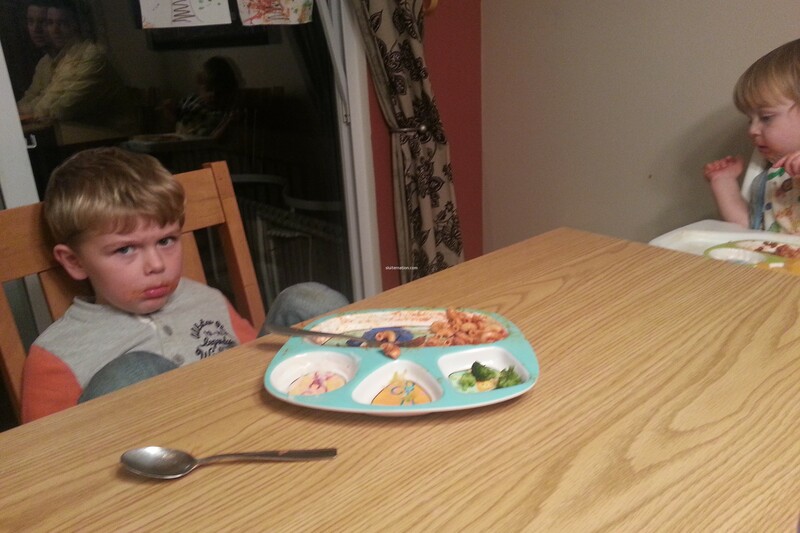 November 11: Charlie Bird shows his intense dislike for Mondays…except later that morning his new cousin would be born! Welcome Ezra! November 12: Home sick. Boo cough and yucky throat. 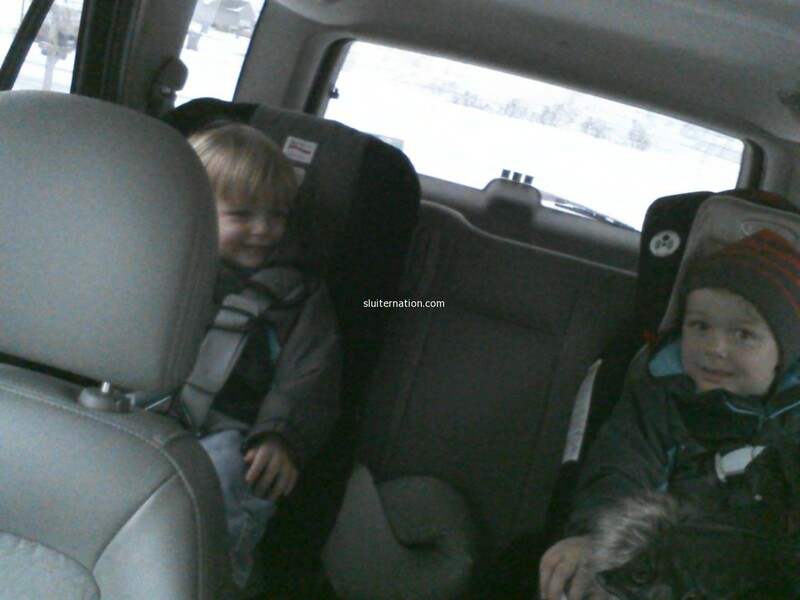 Cortney got to visit Ezra and Kenzie and I had to stay home. BOO. November 13: 20 months today! November 14: Last night of parent/teacher conferences. Phew! 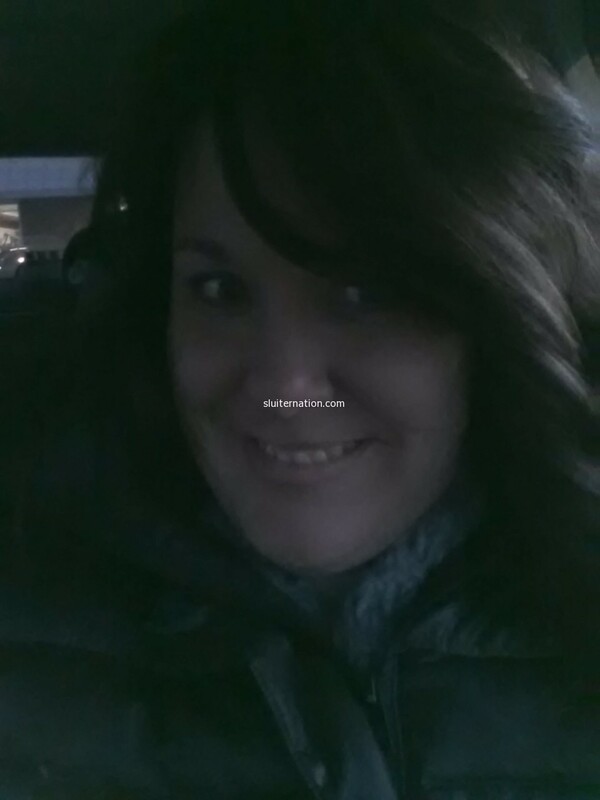 November 15: it’s a hair day…new bangs for me! 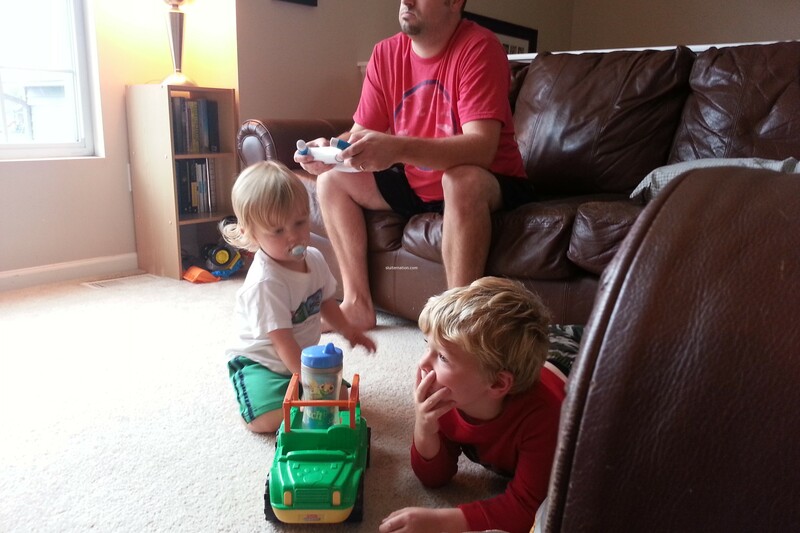 November 16: Boys playing “beep beeps”…or as we non-toddlers call them, Trucks. Parent/Teacher conference week is always tough. I go two full days without seeing my boys for more than a couple minutes in the morning. But in the end, I didn’t have to bring any work home over the weekend, so it was a win! Fall poured in this week in the form of wind and rain and chilly weather. The time changed and now it seems we live in darkness. 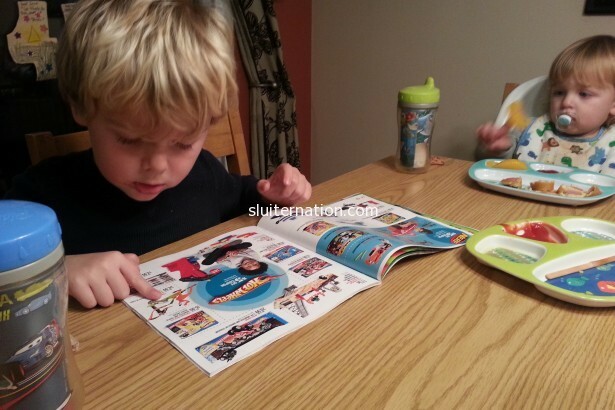 November 3: The Target Toy Catalog came!. 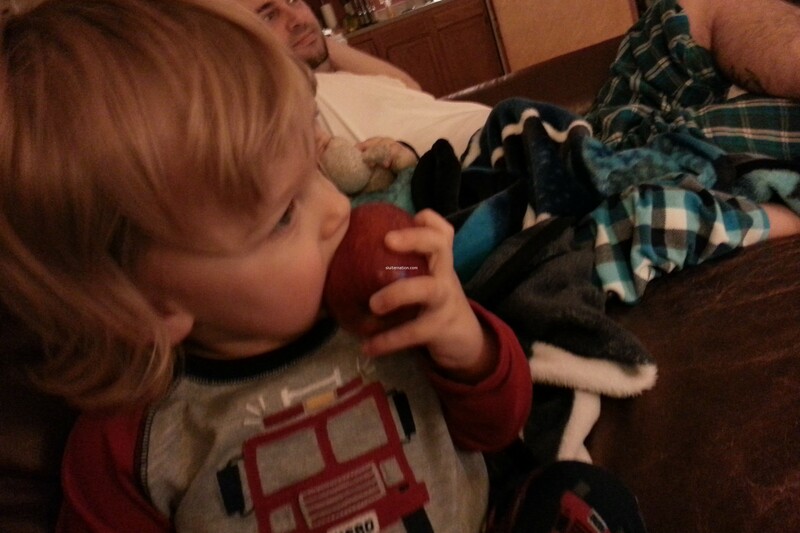 November 4: I think my boys might be addicted to apples…and I am Ok with that. November 5: Grades are due in the morning. I have a ways to go. November 6: Why does getting a hair cut suddenly age him? Sigh. 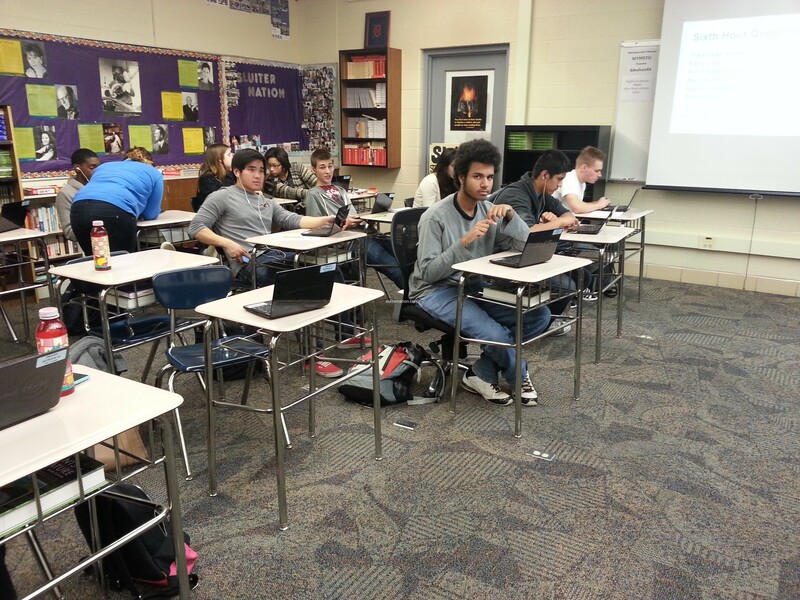 November 7: My students work on a webquest while I rest my voice that is quickly leaving me. 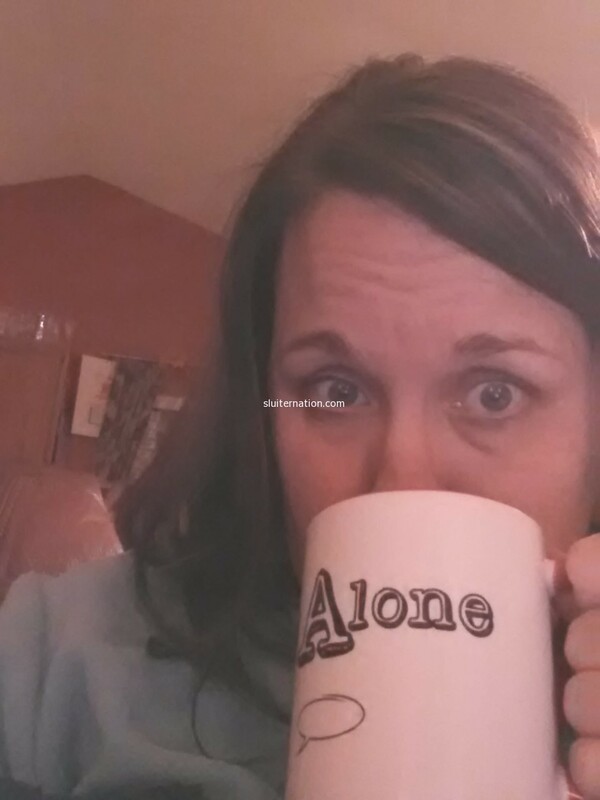 November 8: After a morning of meetings and an afternoon of parent/teacher conferences, my voice is all but gone. So tea. November 9: His two-year molars are coming in on the bottom so he is a snotty, coughing mess. My voice is gone and I may have a sinus infection. So cuddles. We made it through this dark and rainy week. And we still have smiles on our faces…I don’t have a voice, but I do have a smile. I say that’s a win. 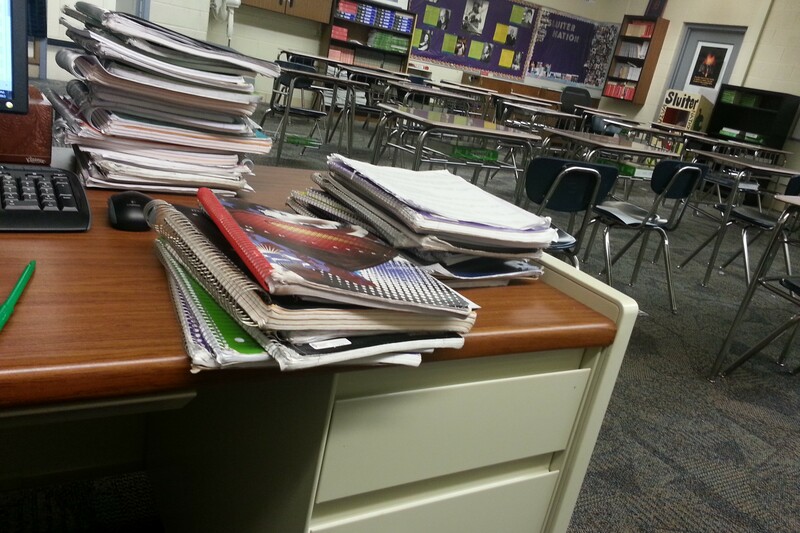 Last week of the marking period. We have been non-stop this week. I can feel it in our relationships with each other. October 27: Pumpkin carving. 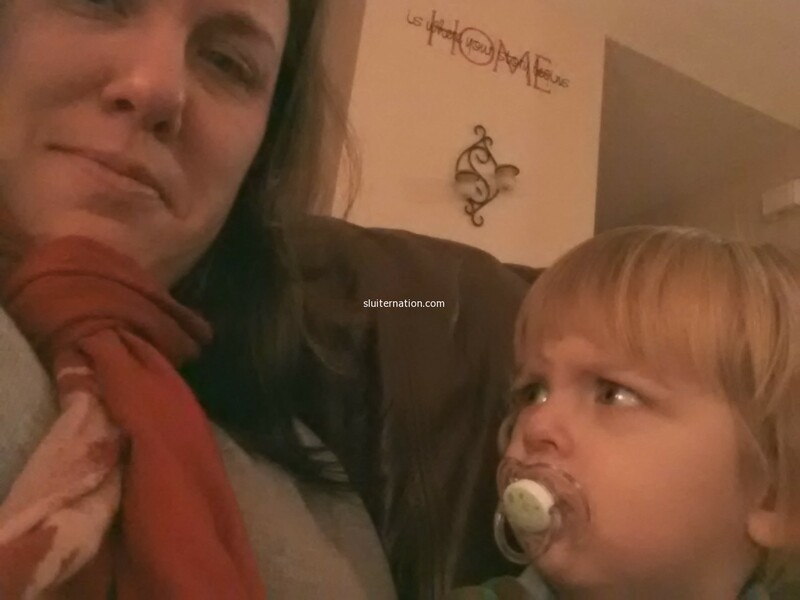 He has never liked the guts…and this year is no different. Wouldn’t touch ’em. 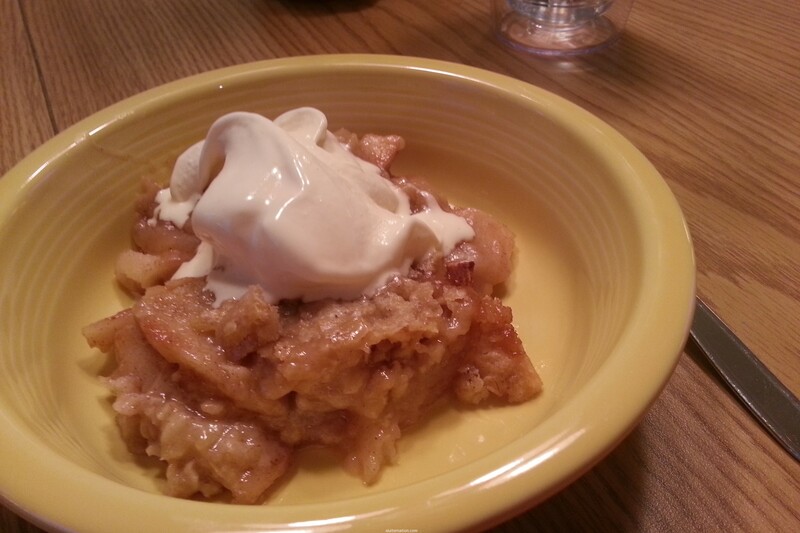 October 28: Comfort food for dinner followed by homemade apple crisp and homemade cinnamon ice cream. October 30: I look away for a minute and this one is driving a car on the couch. 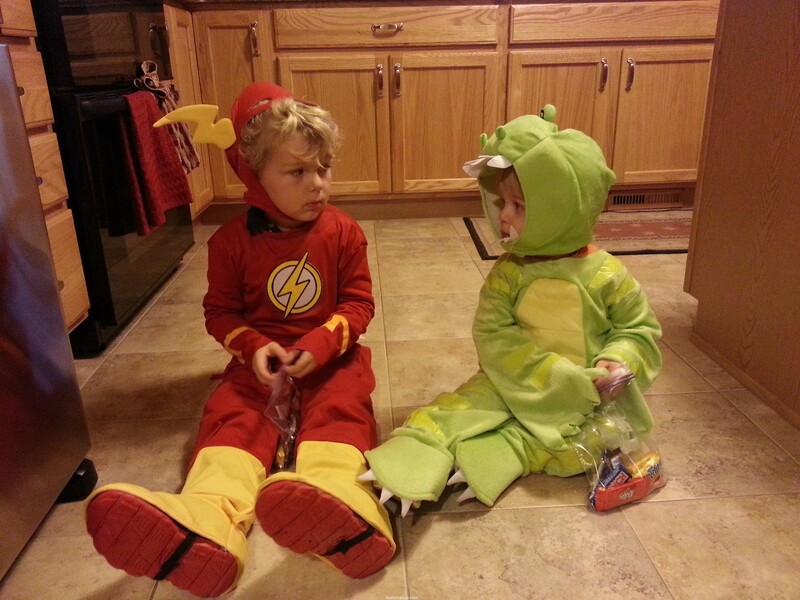 October 31: Neither trusts the other to not touch his candy. It’s a legit mistrust. 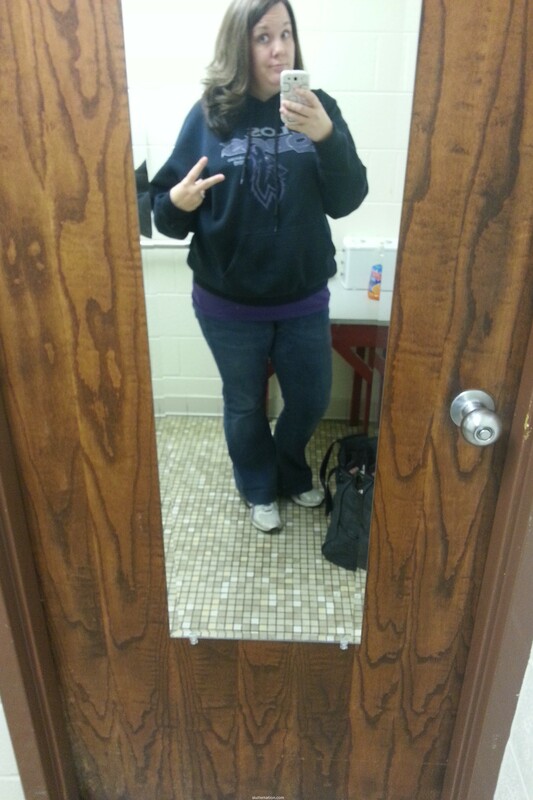 November 1: Peace out, week…and October. November 2: Cort gets a much-needed night out while I have a night in with these two. Something needs to give around here. But not until the grading is done. Hmmm…maybe we have an issue. In YAY news…I’m going to be a published writer. 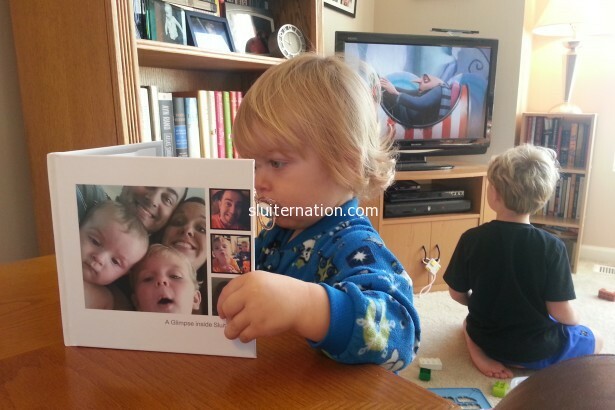 IN A BOOK! Three Minus One comes out in May of 2014 and piece I wrote about my first miscarriage will be included. I am honored to be chosen. Week 43 started out tough, but it turned around. 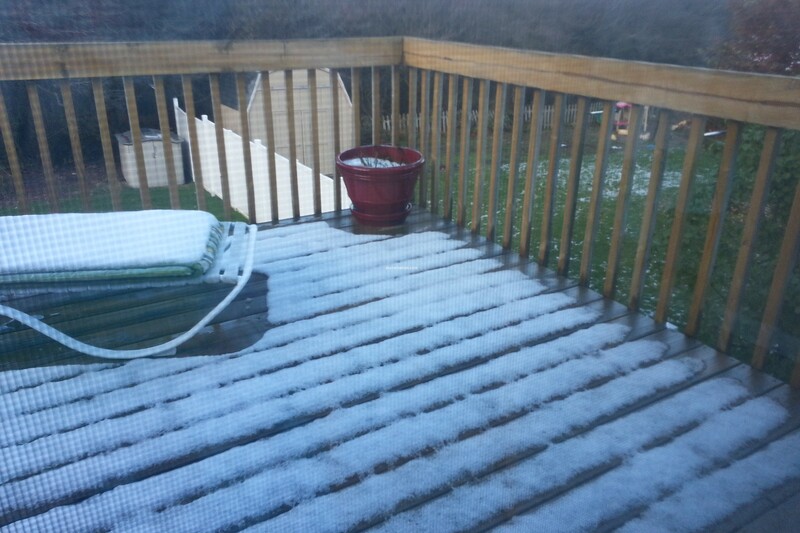 And then the weather got drunk and thought it was winter. Just an average October week in Michigan, yo. October 20: Arabella’s Memorial Service. 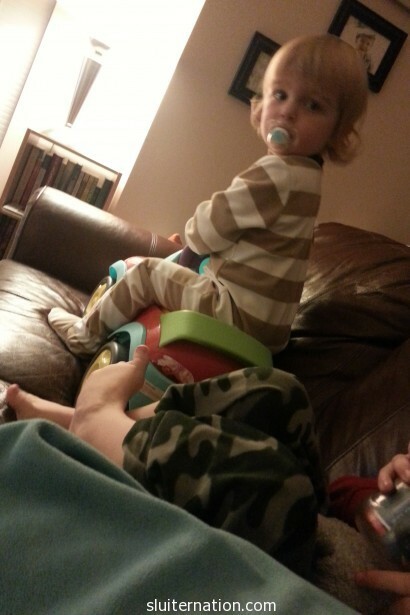 October 21: Jammies happen wherever we can catch him. 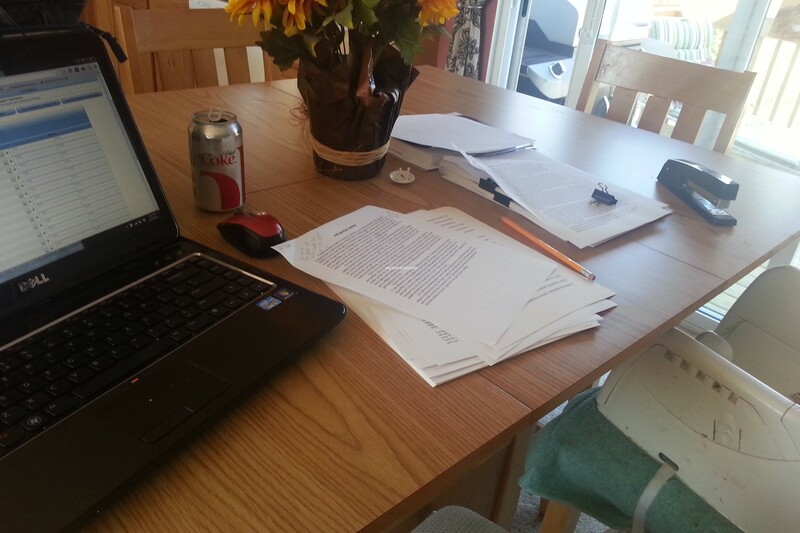 October 22: A tiny glimpse into my work space. 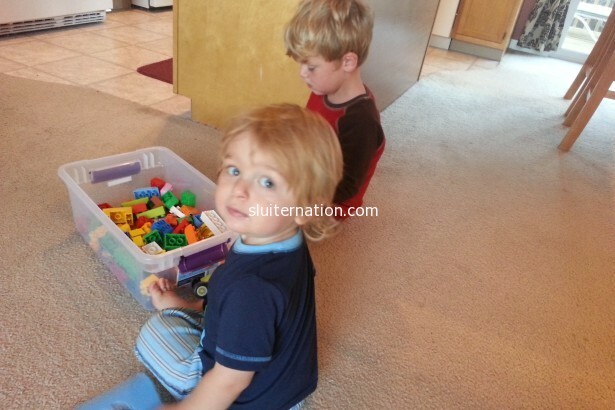 October 23: Charlie enjoys annoying his brother. And yes, Eddie is HIGHLY annoyed in this picture. 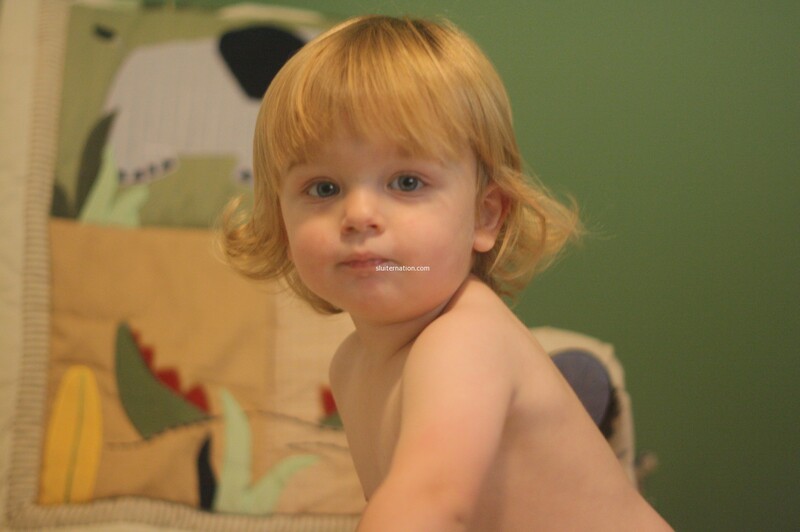 October 25: I trimmed his bangs and inadvertently turned him into He-Man. Also? 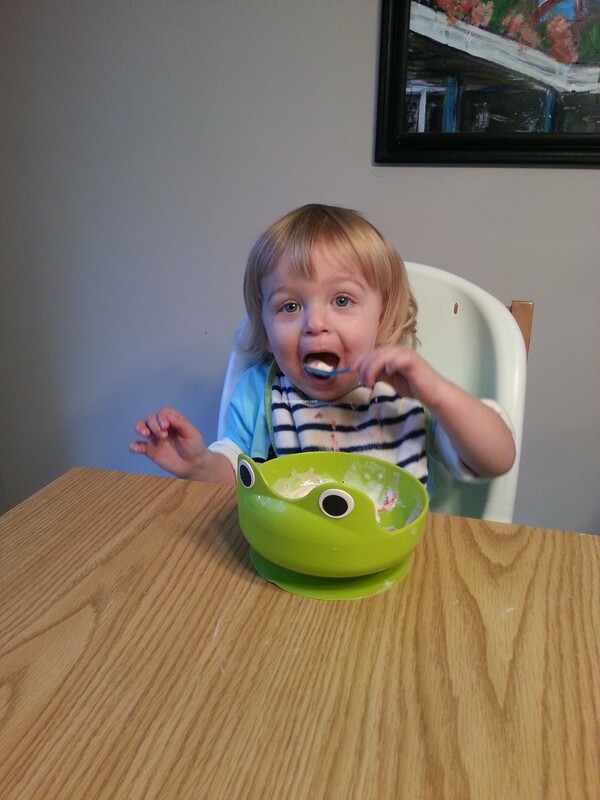 ICE CREAM IS GOOD! October 26: We went to pick pumpkins. Yes, that is a Primus hat. What? You *don’t* put your 19-month old in a rock band stocking cap? Let’s hope for less of that this week, shall we? Ten weeks left of 2013. This week fall finally showed up; that was sort of awesome. This week was hard with a loss in our family. But as usual, it was also awesome. 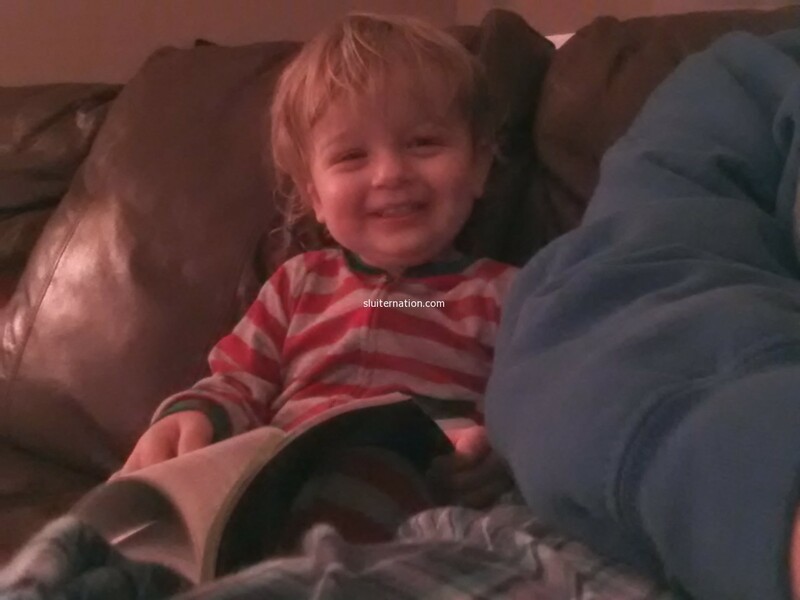 October 13: The Bird is 19 months old today, and reading. Ok…looking at pictures. 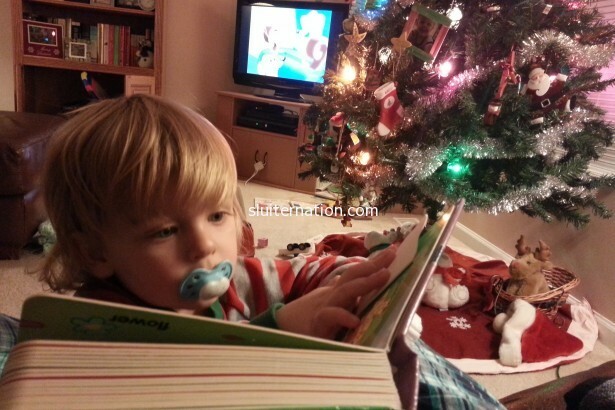 Still…the boy loves books! October 14: Stop. 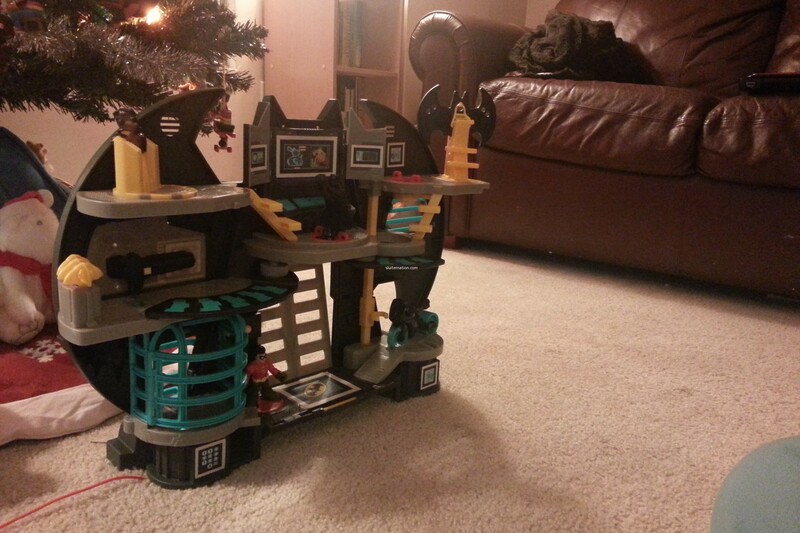 Lego time. October 15: A hard day. It’s National Infant Loss and Remembrance Day. October 16: for some reason, this guy keeps waking up SUPER early while I am getting ready for work. I think he is try to sneak extra time with me. 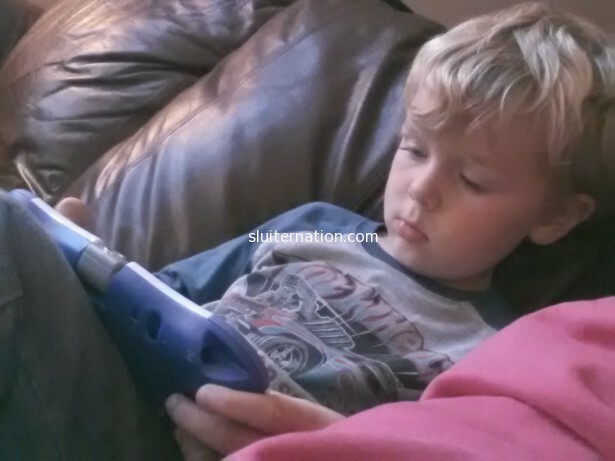 October 17: Science games on his tablet while mommy watches the news. 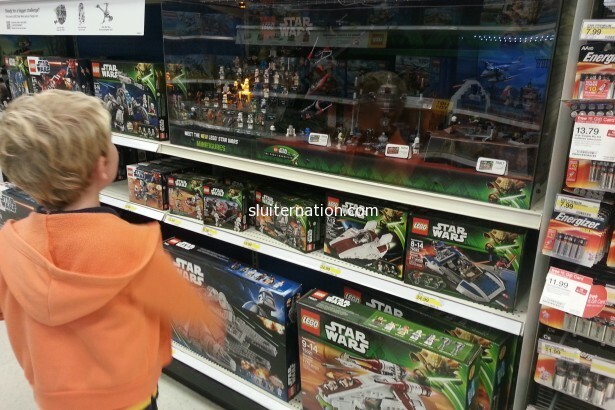 October 18: Eddie and Mom date for choosing a Halloween costume…plus “window shopping” the Lego aisle. October 19: Chili Cook-off and Euchre tourny to celebrate a great friend’s birthday. I didn’t win either contest, but I did have a LOT of fun! Even though we had a rough few days, we still managed to have a great week. We have so much wonderful family and many MANY awesome friends. Plus we have each other. 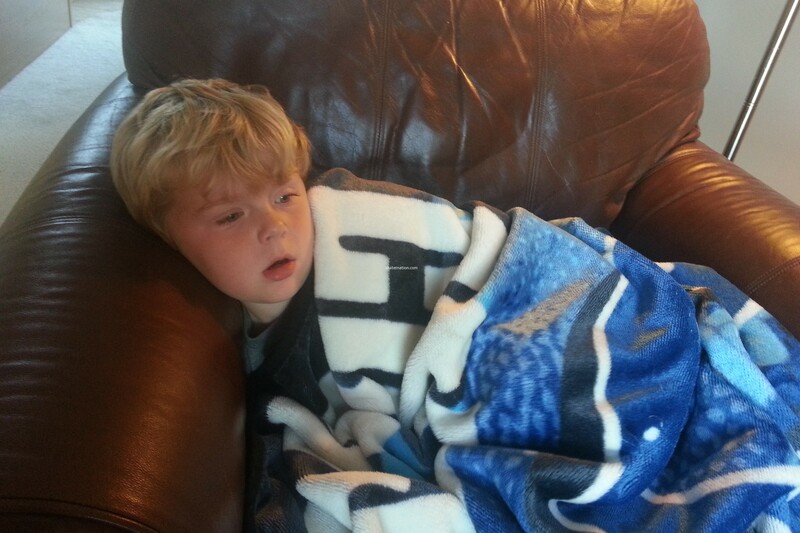 A kid gets sick and the whole week gets weirded up. 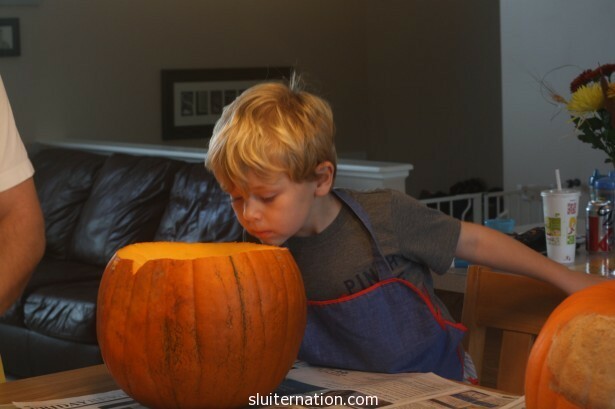 October 6: Just a typical Sunday in Sluiter Nation. 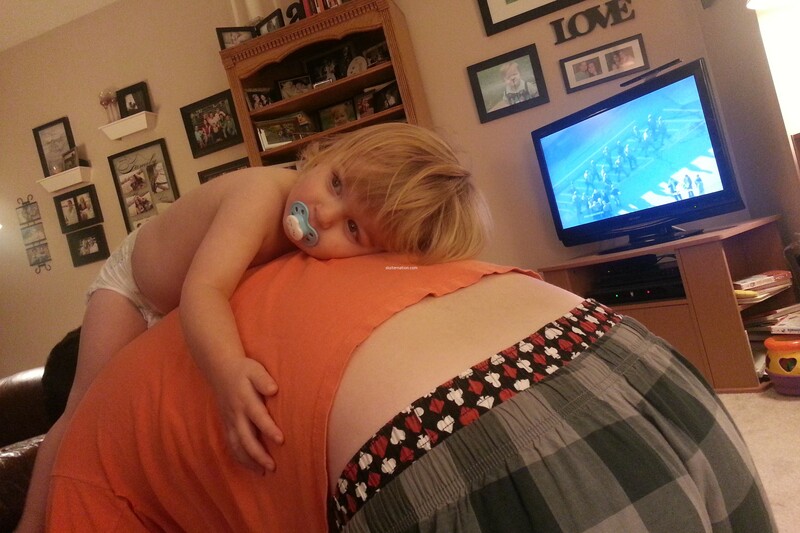 October 8: This one get sent home from daycare with a 102* fever. And the week tanks. 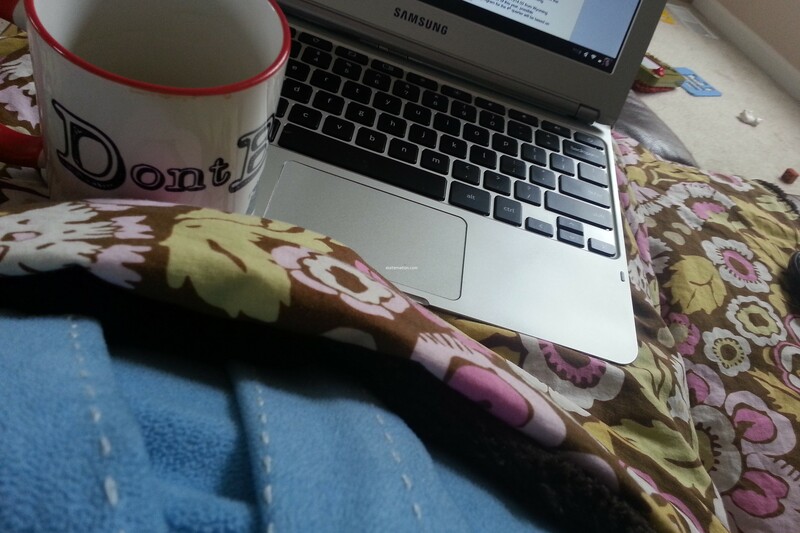 October 9: I stay home with the Edster and try to get some work done. October 10: Day 3 of The Sickness. 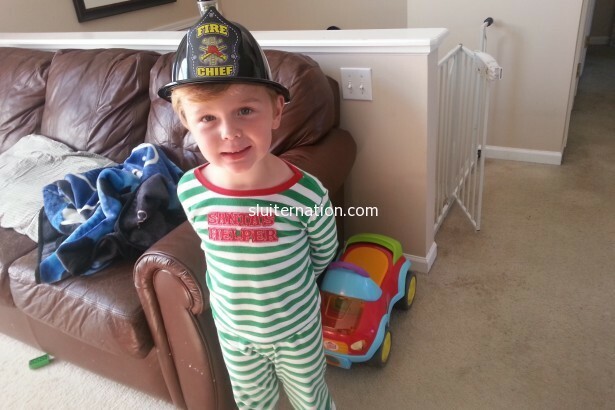 His bestie got him the souvenirs from the preschool visit from the firemen. Eddie even smiles about it. October 11: Day four of The Sickness…it seems to be gone. 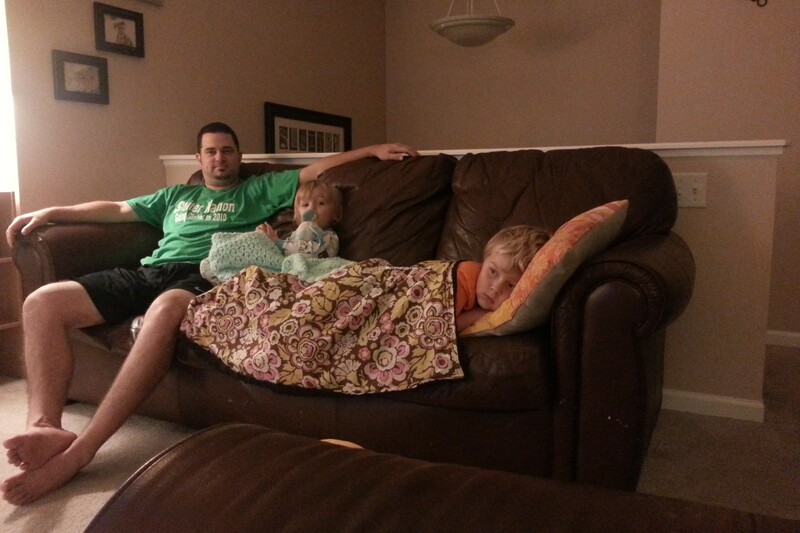 And we end the day in a snuggle pile. 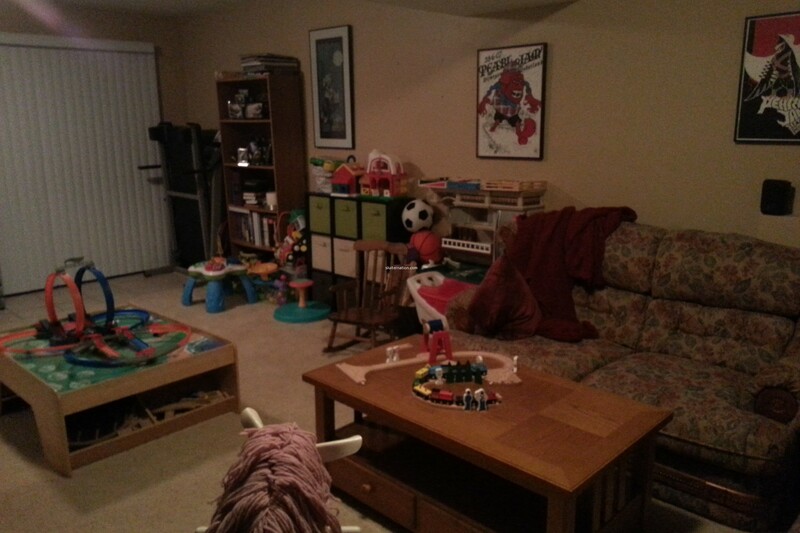 October 12: Cort worked SO hard today to organize our basement areas. 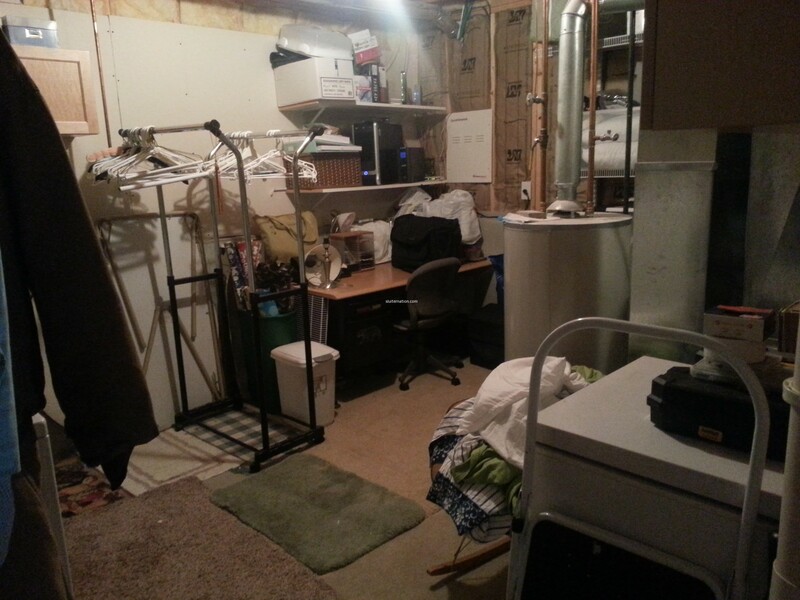 This is the laundry room…I even have a desk for my craft area now! The week could have been more productive, but it was good to slow down. I hated seeing my little buddy feel like garbage, though. At least the weather report is calling for some actual fall weather, we made headway on Project Basement Organization, and everyone is feeling better. Here’s to a new week.